Maybe blogging has gotten a little "old"? I haven't written much on this blog in a while. But I am not ready to give up on the concept...and I'm not ready to give up on #BlogElul, either. #BlogElul is a project that I started in 2010, although it wasn't until 2012 that I created the list of topics. Since then, I haven't always completed the whole month of blogging, although I know that many of you have. I also know that the online world has changed so much since 2010, when blogging was one of the only ways to publish your online content easily. Now we have Facebook, Twitter, Instagram, SnapChat, and other platforms...so many ways in which to express ourselves and dive deeply into the themes of the High Holy Days. And so here we are….I've added #ElulGram to the #BlogElul family and the borders of this project are so wide that they reallly don't exist at all. This project is really whatever YOU want - however YOU want to spend your time preparing yourself for the holiest season in the Jewish calendar. Elul -- that wonderful and terrifying month that precedes the High Holy Days. A month of introspection and considering, a month of personal reflection and preparation. Who can participate? ANYONE. It's yours. I gift it to you. Elul is for anyone and everyone. How could I do it? I don't have a blog… No worries. Maybe you have Facebook or Twitter? Maybe you're a big fan of Instagram? Be creative and find your own path! Maybe you don't want to do it daily. Maybe you just want to dip your toe into the experience, or just read (and share?) what others write. It's totally up to you. I always love to see the creative things that the #BlogElul community comes up with. There are no rules. I provide the topics (see graphic or below for text) for each of the days of the month. Use the hashtag to share your post (I like to put it in my titles) and share other people's posts as well. This could be a way to revitalize your blog, kickstart a new project, or even just get yourself ready for the holidays! 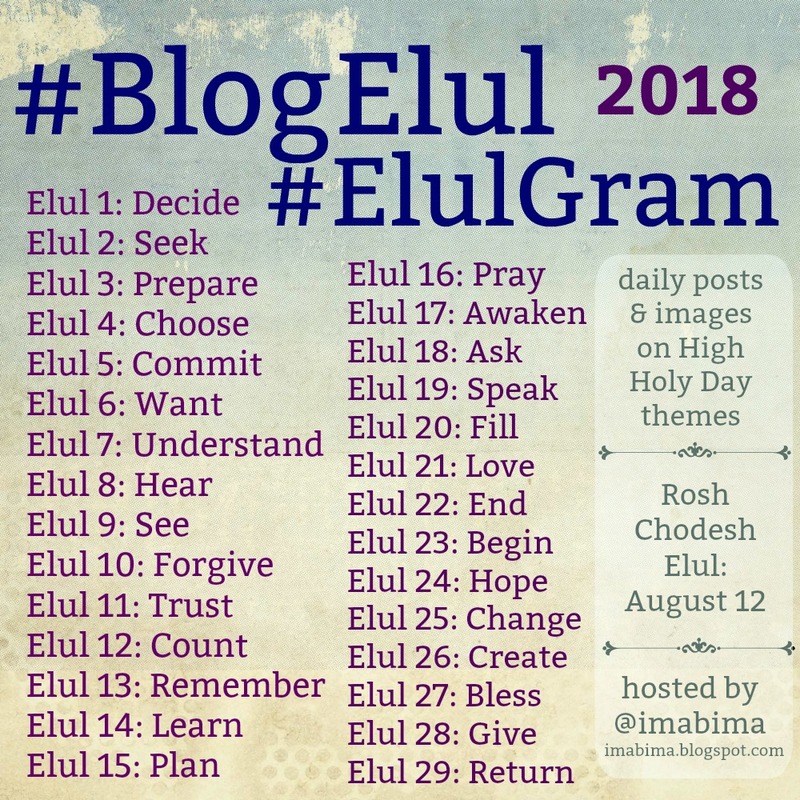 I know that lots of people use #BlogElul as a spiritual exercise each year, and I'm so proud to be a part of their yearly journey through Elul. And what about #ElulGram? This one is even more interpretive. Photos, art, illustrations, quotes -- what kinds of images can you put together to explore and interpret these High Holy Day themes? You don't have to limit your picture-sharing to Instagram (even though I totally appropriated the name), you can use any image-sharing site you'd like, such as Facebook, Pinterest, Twitter, Tumblr, etc. Whatever you do, tag it with #ElulGram so we can call share and follow. These themes and ideas are broad and open, and again -- remember, there are NO RULES except the ones you make for yourself! And yes, I know that the dates include Shabbat. I personally don't blog/tweet/Facebook on Shabbat, but I will post before and after Shabbat. You can do whatever you like! I'm looking forward to sharing this journey with you. 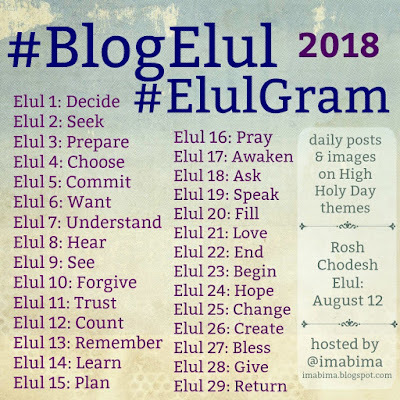 Elul begins on Sunday, August 12 (it's always on time), so I wanted to give you a head start if you're going to pre-write some of your posts. I hope that our shared preparation for 5779 brings meaning and hope, inspiration and enlightenment for all of us. 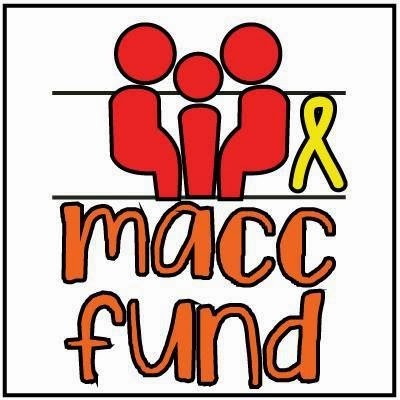 I love this project and plan on blogging about it. We're redoing our kitchen, A Jewish Grandmother : Bye Old Kitchen, You're History, which is another form of renewal. Right? That gives me a spiritual boost, too. Thank you for doing this! Bringing this idea to a new community. I’m so glad that you are still doing #BogElul. I have a blog, but I’m not certain how to post mine so it can be read by others nor do I know how to read other blogs. Thank you for doing this again. I am not sure I will be posting, but I am journaling. So grateful for this practice!